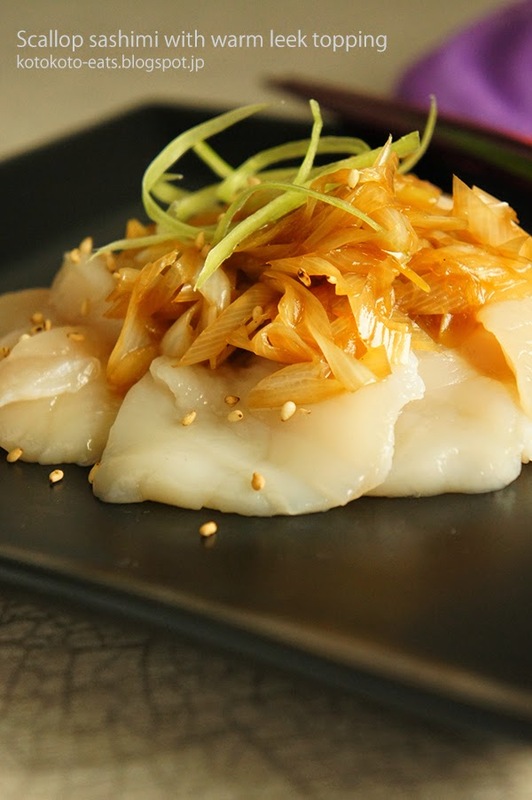 Here is a recipe for scallop sashimi with warm leek topping. Ingredients are so simple (if you can get sashimi quality scallops), and so incredibly fast to make! 1) Lay the scallop pieces onto a serving plate. 2) Shred the leek into thin slices. Pour sesame oil into a skillet. Stir fry the leek on medium heat til tender ( but not completely soggy). 3) Add lemon juice and soy sauce. Add salt if you need to. 4) Set the skillet off the stove. Once it cools down a bit and not steaming any more, place the leek and the sauce over the scallops. Sprinkle sesame seeds on top. This serves as a great appetizer. The green part of the leek can be cut into very thin pieces to be used as garnish on top. After cutting them, soak them in cold water for about 5 minutes to make them curly.